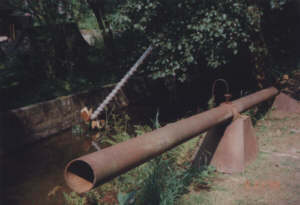 An iron pipe, 6.66 m in length, is divided in two symmetrical chambers by a plate and supported on an axis like a seesaw. Both chambers have a drilled hole near the center. 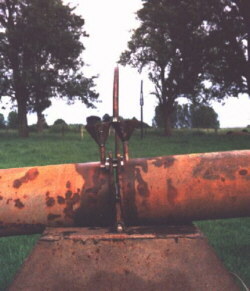 So water runs into the teetered up chamber. After a while the respective chamber goes down releasing the gushing water into a reservoir. Now the other chamber is being filled. One cycle takes about four minutes time. Interesting noises like plashing deep inside the pipe, the gush and the gong when the falling end hits the ground, attend the kinetic tension produced by this array.